Tesla CEO Elon Musk introduced the new Model Y midsize all-electric crossover this evening during an event at the automaker’s design studio in Hawthorne, Calif. 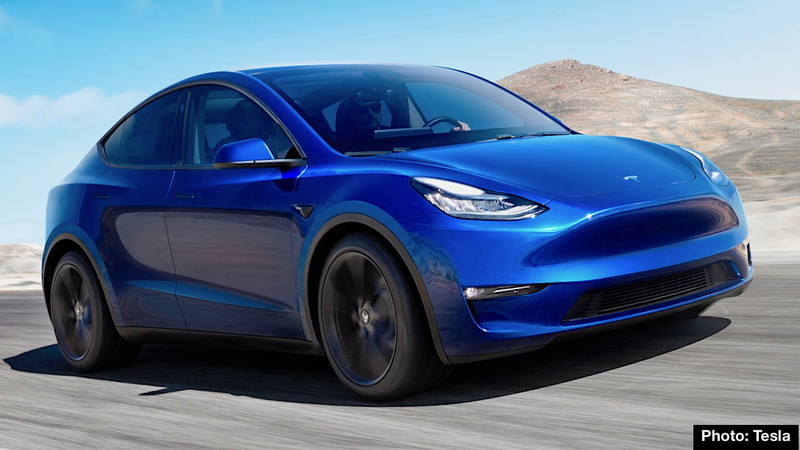 Smaller than the Model X, and minus the gull-wing doors, initial deliveries of the Model Y for U.S. customers is expected to begin in Fall 2020. With its high-efficiency powertrain and ultra-responsive motors, Tesla quotes 0-60 mph acceleration in about 3.5 seconds along with a top track speed of 150 mph for the top Performance edition. Driving range for the Standard Range version is said to be 230 miles, while the Model Y Long Range is reportedly capable of driving up to 300 miles on a single charge. Prices were announced for the Long Range Rear-Wheel Drive ($47,000), Dual-Motor All-Wheel Drive ($51,000), and Performance ($60,000). While Tesla quotes the base price for the Standard Range Model Y at $39,000, that version isn’t expected to be ready for delivery until Spring 2021. Signature design elements include a panoramic glass roof, high seating positions, and a single 15-inch touchscreen interface. With the Tesla Mobile app, Model Y offers access to a variety of features including remote unlock, Summon, remote pre-conditioning, location tracking and Speed Limit Mode. With its smaller footprint compared to the Model X, the Model Y still offers expansive storage space. The front trunk and split-folding second row provide a total of 66 cu. ft. of room for gear. Model Y is designed to be compatible with Tesla’s network of more than 12,000 Superchargers located in 36 countries, along with the new superfast V3 Supercharger.